The ever-increasing need to reliably transmit data, voice, and high-resolution imaging via a satellite link is demanding use of the latest technologies in transmission modulation techniques to achieve highest data throughput, as well as extremely high signal fidelity on both the transmitter and receiver sides of the system to minimize data errors. Tek provides the tools that are up to the challenges of testing at both the system level and the component level. The ability to reliably transmit and receive secure communication is vital to military command and control. Every element in the link can adversely impact the quality of the communication. Having the right test equipment is essential in the design of a new system, performance verification of an installed system, or the repair system components. To address these needs, the Tektronix DPO77002SX provides the ability to acquire any signal from DC through most of the V-band (up to 70GHz). This direct acquisition without the use of downconverters provides minimum degradation of the signals being tested. 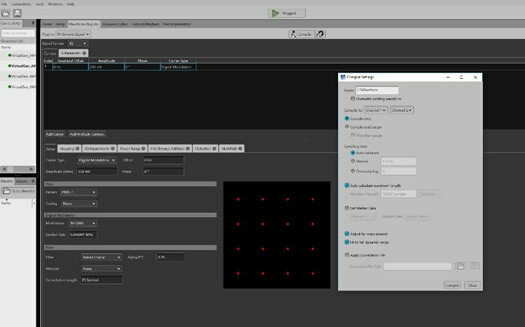 The fully integrated SignalVu software provides spectral analysis, demodulation (e.g. QPSK, 16QAM, etc. ), constellation diagrams, and EVM measurements directly from the acquired data. Measurements can be corrected from system loss and reflections in the signal path (e.g. waveguides, cables, etc.) using the SDLA optional software. EVM measurements of 2.1% have been achieved using this equipment. 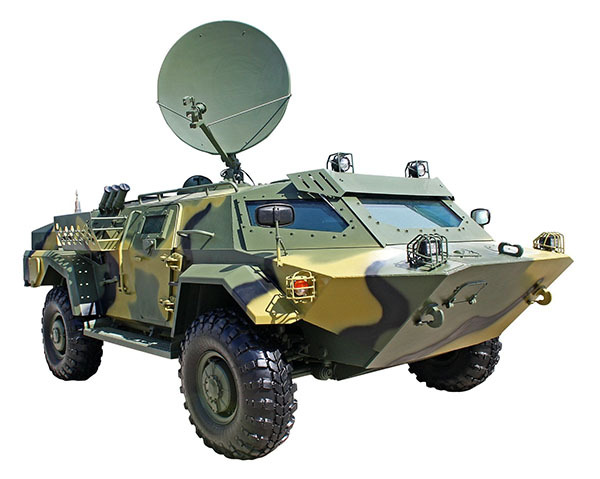 Example of a high performance mobile SATCOM platform with full RX and TX capability. Having the communication system capable of sending signals for tactical command and control, intelligence, surveillance, and other combat support information is critical to keeping you safe and one step ahead of the opposition. However, finding the right signal source to fully test your communication system and components can be challenging, especially if you are trying to generate impaired signals to stress-test that system. The Tektronix AWG70000A and AWG5200 signal sources are well suited for generating complex modulation baseband, IF, and RF/microwave signals (e.g. BPSK I&Q, 16QAM, and many others), and can also be used to add a variety of impairments to stress test the system using the fully integrated SourceXpress software along with the RF Generic Plug-in. A precomp feature in SourceXpress allows for automated compensation of losses between the AWG and the DUT. Screenshot of a general-purpose demodulation measurement, showing a signal with very low EVM over a hundred or so acquisitions. User interface for SourceXpress being used to create a 16QAM signal for output on the AWG70000A. A webinar that focuses on the challenges related to the creation and generation of complex radar signals. Will provide you with some tools to help make this task more efficient. This application note explains how to take advantage of the increased sample rate, analog bandwidth, memory, and digital outputs found in the Arbitrary Waveform Generators (AWGs) in order to: increase resolution, decrease false target returns, and increase the probability of detecting actual targets. 14.1 Gbps hardware serial trigger - Assures triggering on the first instance of a specified 8b10b pattern to allow isolation of pattern-dependent effects.